I'm using the TIBCO Jaspersoft Studio Community Edition plugin in eclipse. Not sure if this is a bug, it seems more like a settings / config issue. This plugin has been working fine for months but recently whenever i try and edit any Java report, the expression editor shows a basic text editor instead of the fully featured object viewer. I've attached an image that shows the current expression editor, and even the inline help which shows what the editor SHOULD look like! It seems like I've miss clicked somewhere or hit a shortcut i did not know about and disabled functionality in the editor. that basic editor is used whenever a language different from Java or Groovy is used when designing reports. Apparently your report language is "Java" so there is some other cause for its appearing. Did you notice if this happened after upgrade? Did you try installing the plug-in into another Eclipse version? For some reasons it could be that the expression editor dedicated plug-ins are not loaded and therefore the fallback (simple) editor is created. Can you please attach also the error log? 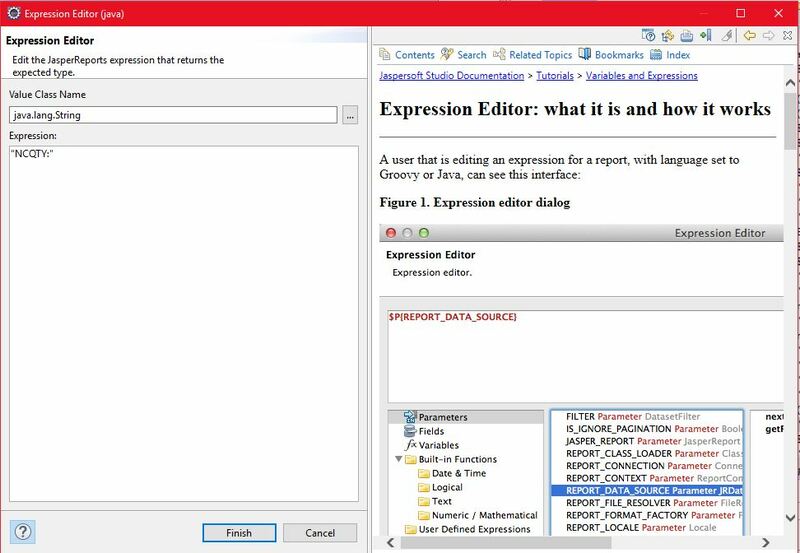 As far as I can remember there is no special configuration that prevents the Xtext based expression editor to show up. In the meanwhile I will try to install the 6.6.0 version into an Eclipse version 4.6.0 like yours. No problems detected in trying to open the expression editor. I installed a 6.6.0 version inside a 4.6.0 Eclipse.